We are 7 weeks into the project and now in the finishing stages. The new entry fencing and gate goes up this week along with the entry walkway sky light that runs the entire length of the walkway. Staying dry and letting in the sun.......a two-fer. Cutting the roof back to the wall line has already allowed more light into the kitchen / road side of the house. 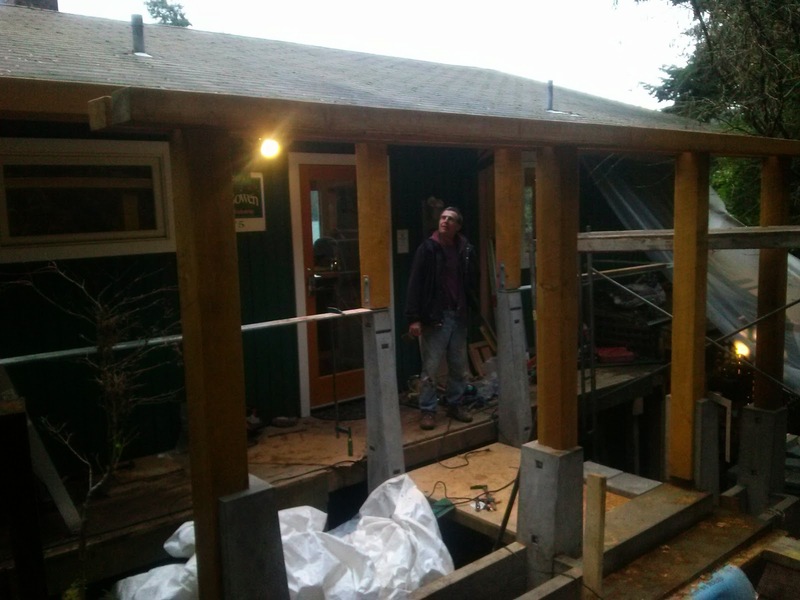 Conrad Wood the designer contractor for the project proudly admires the new beams and concrete in the new entry facade. We celebrated the US Thanksgiving in the newly functional Lazy Bowen Hideaway kitchen. All I can say is I wish I could stay longer to enjoy cooking in the Whirlpool Gold Convection oven. I must remember to leave a note for the guests to deduct 30% of cooking time when cooking on the convection setting. Everything is evenly golden brown and cooks so quickly. It is fantastic!! I cooked the Apple Crisp in the Micro / Convection oven and it turned out just beautiful. By far the 10' granite counter space was generous and perfect for preparing a large holiday meal. Thanksgiving was the perfect test for the new kitchen and my 4 guests. When cleaning up the open plan between the kitchen and the living room allowed for easy & festive conversation.........the room is now truly a GREAT room that I am certain our guests will LOVE!! 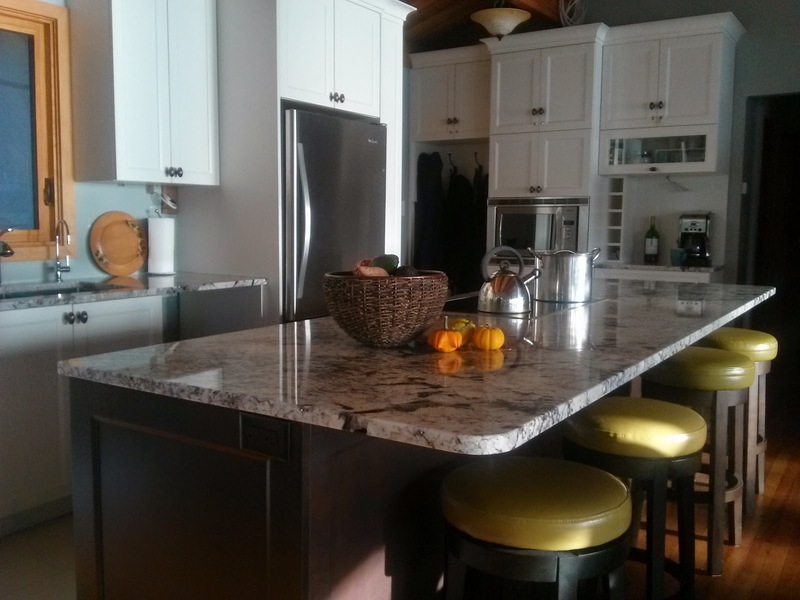 10 foot granite island is ideal for prepping meals and conversation. WOODCO CONSTRUCTORS Inc. is an outstanding group of wood working, rock laying, concrete making artisans that know quality construction. Conrad Wood is the owner and operator. He is "an experienced builder known for quality work on jobs of all sizes. His core values are to be truthful in all interactions; perform all tasks well; and to provide fair service to all persons." I am impressed with Conrad's intuitive and listening abilities to design and construct specifically for my expressed needs. I don't easily turn over control of a creative project but I have felt 100% confident that my needs were being considered in every decision and that the quality of work performed by Conrad and his team is beyond my expectations. I am extremely satisfied and highly recommend Woodco whether on Bowen or in the Vancouver area. While working on the decks they uncovered water damage on the storm side of the house with a carpenter ant habitat to-boot. They didn't cover it up......rather they made it right even though it added a day to the project. I certainly appreciate their attention to all the details. 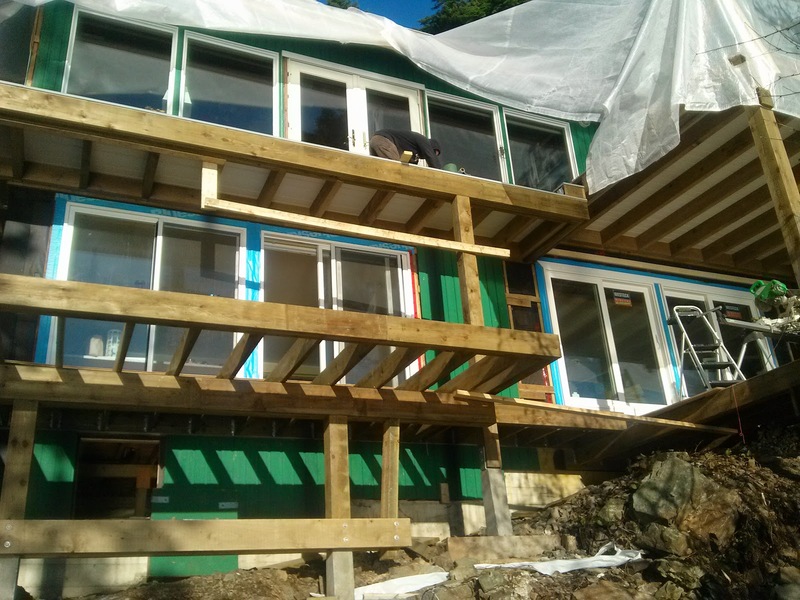 I had no idea what it meant to have all the upper decks waterproofed. What a process!!! 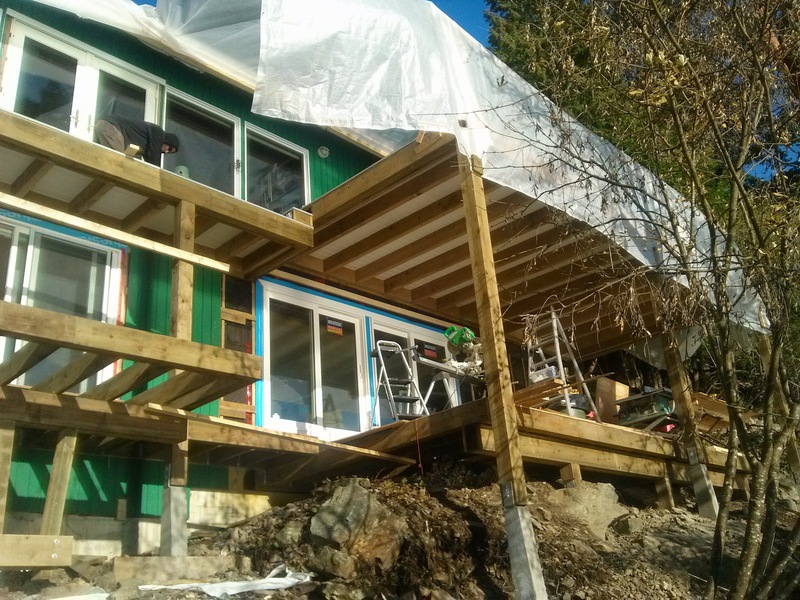 The plus side is that it will protect the lower decks and the house from future water damage. 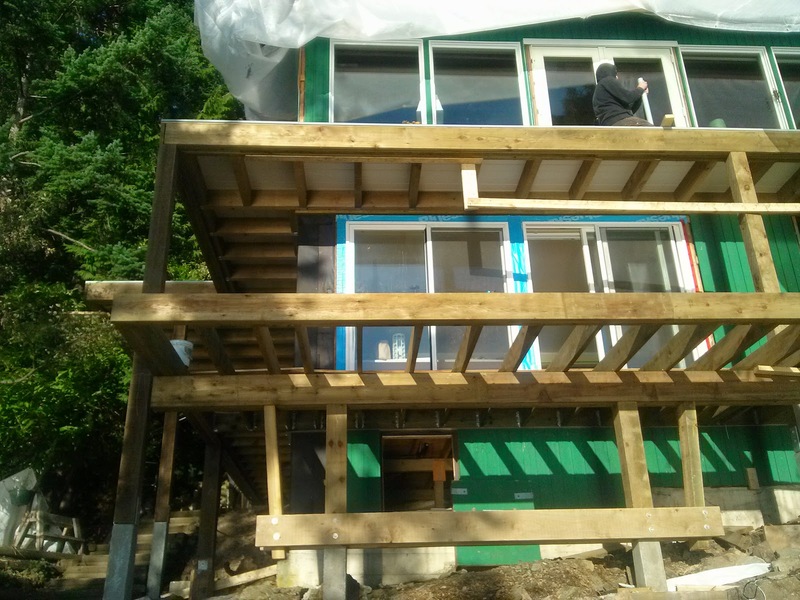 The big benefit is that it has created a private weather proof deck for the Petite Suite guests with a fantastic view of the Coastal Mountains, West Vancouver and the ferry lanes. 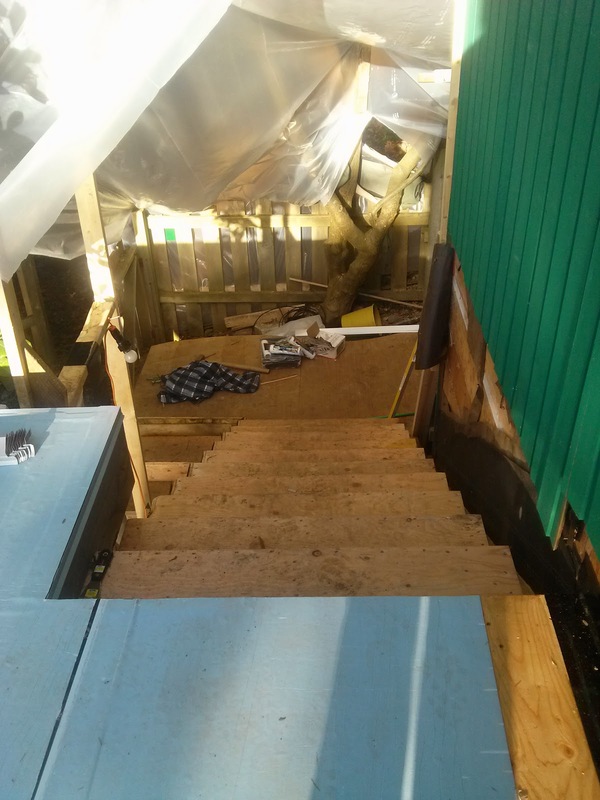 We also eliminated the stairs between the Hideaway and the Petite Suite decks to create more separation and privacy when we have 2 separate groups staying at our newly renovated vacation rental. Notice the 2 new sliding glass doors off of the Petite Suite. The new light and views inside the Petite Suite have now doubled. Picture this.....lounging in the Petite Suite bed, surfing the net, having a cup of coffee, and taking in the 12 feet of ocean views. Now that is a great way to spend the day!! 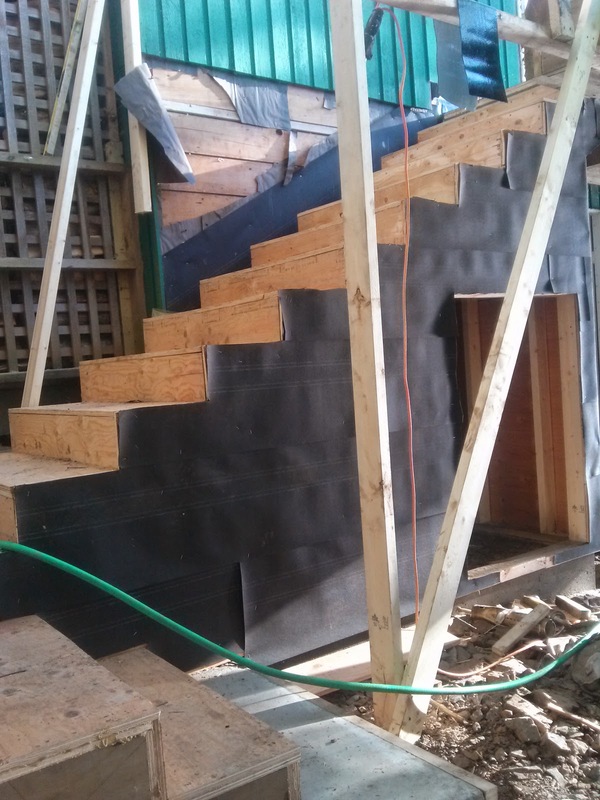 The stairs coming out of the Lazy Bowen Hideaway dining room door were redesigned by Conrad Wood, owner of Woodco. Again they are waterproof creating a dry storage space under the stairs. they now land at the wood shed level to a generous landing. 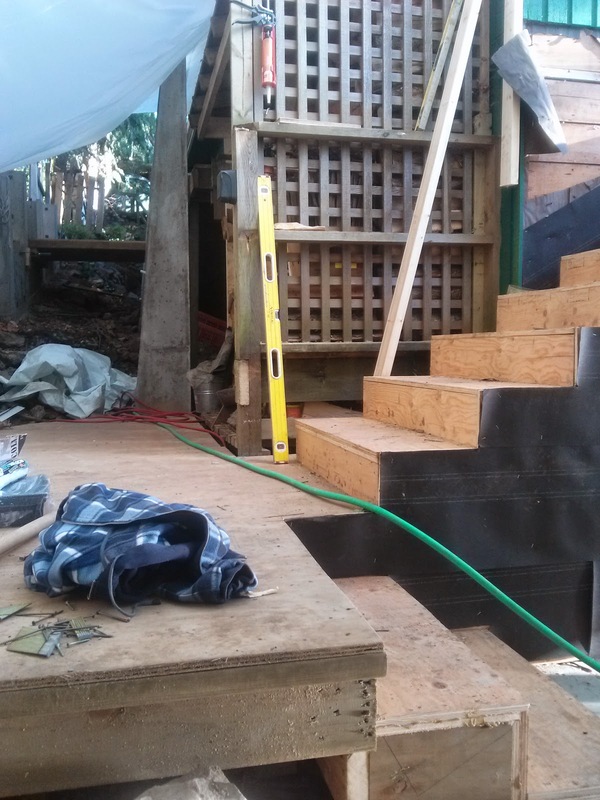 The stairs and the landing will all be finished with concrete pavers that will never rot, sag, or grow slimy algae....a safe and long lasting solution. Dining room stairs with dry storage under. The new landing of the stair efficient and makes so much sense. Thank you Conrad. The Hideaway dining room deck will hold the propane BBQ and the dining table. Convenient to the kitchen. 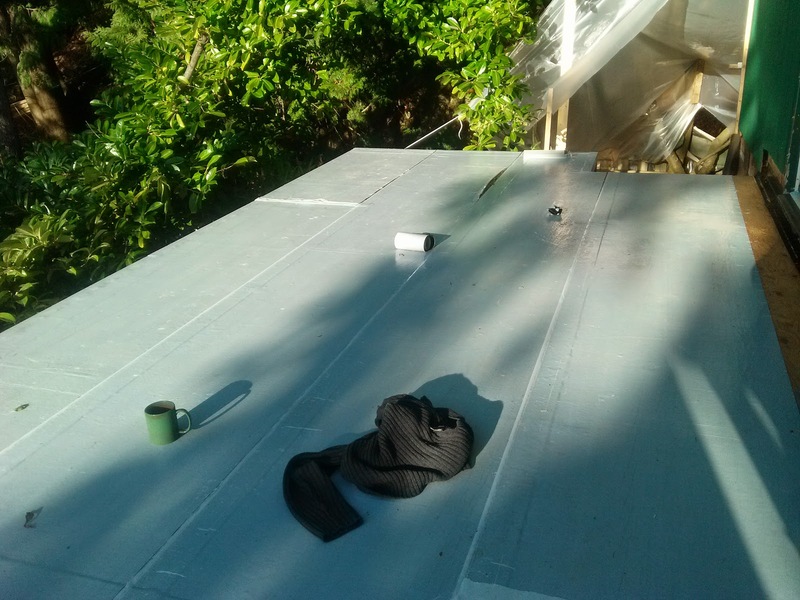 Again the dining room deck is weather proof creating a dry entry to the Petite Suite for our guests. 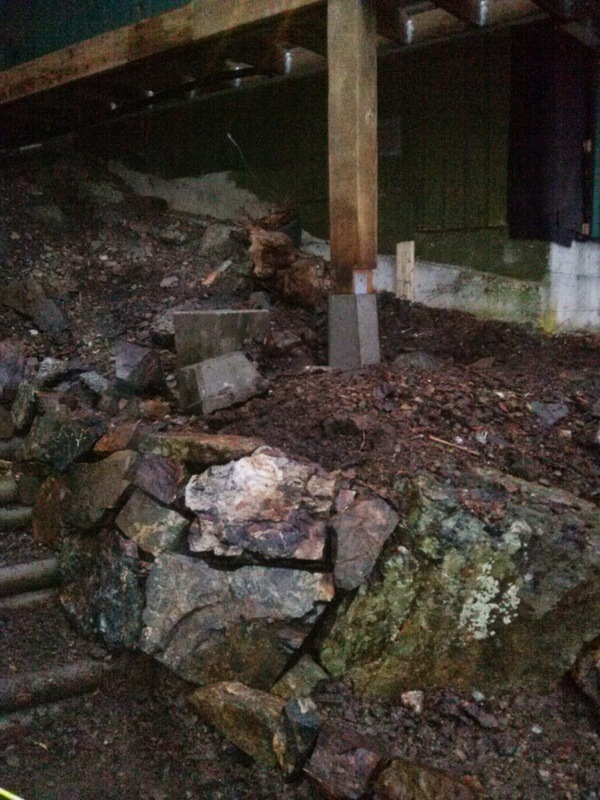 Today the crew cleaned up the seaside yard of construction debris. They then re-placed the huge boulders into a new landscaping layout conducive for planting next Saturday. 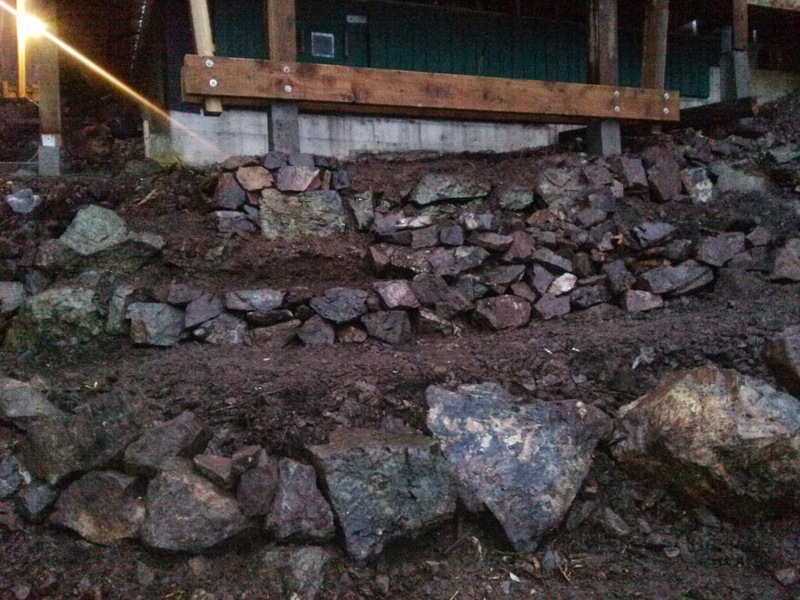 Ben, who is from the UK, grew up working with stones so he is a natural when it comes to building the new rock walls. Conrad has the creative vision for the new pathways leading to the Friendship Garden and safely keeping the guests away from the un-fenced cliff side of the yard. Ben has such a way of placing the stones that you would think they had been there all along......like perfect fitting puzzle pieces.